will you come on the show sometime? 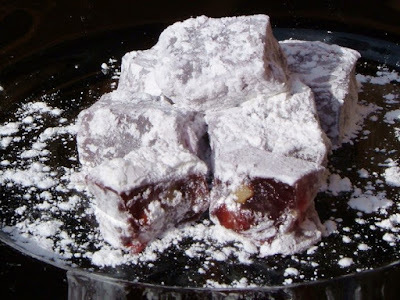 Bryanna, you have no idea how long I've wanted a recipe for Turkish Delight (and I am a huge C.S. Lewis fan, so sympathize with Edmund's addiction). thank you and happy holydays to you. Sure, Louie-- let me know. Let me know how it goes, Dawn! Thanks, Det Daglige Brød i Skovkanten! This stuff was fabulous--much better than the rose water kind that tastes like you're eating perfume! My only question was how to spread it in the pan when it's so hot you can't touch it with your fingers. I tried putting a piece of wax paper over it so I could use a hot pad, but uh...then everything stuck to the paper. So, messy, but tasty! Rose Green, you could try oiling or wetting the spatula and pressing down with that. Is there a way to use another type of sugar and still get it to set properly? 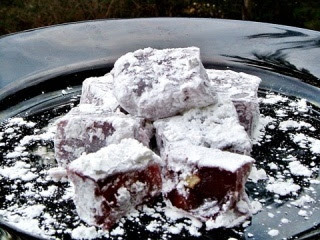 I'd love to make some for Christmas gifts for diabetic relatives. I have no idea, Anonymous. I've never worked with sugar subs. You could peruse some diabetic recipe sites and see if you can find some ideas, perhaps using xylitol, or something like that.